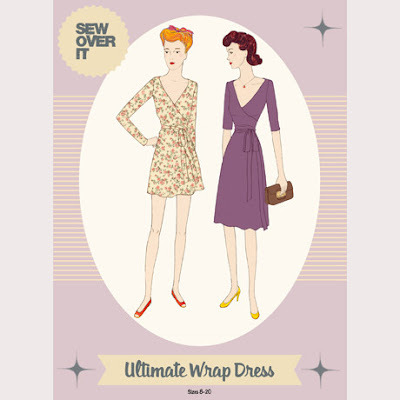 This is the second Sew Over It Ultimate Wrap Dress that I've made, but the first one was scrapped due to rubbish fabric. I do love a Sew Over It pattern, as I don't have to shorten the bodice. There are two different skirt and sleeve lengths on the envelope illustration, but not on the actual pattern. This confused me a bit, but a bit of googling proved a few people had found this. Also the bodice and skirt are all one piece, so there isn't a waist seam. My fabric is a mid-weight poly jersey from The Textile Centre for £3.99 per metre. I had 2 metres, which was plenty for a size 10. I did shorten the sleeves considerably though. I also didn't use the facings, as this fabric is a bit thicker, and also I didn't get on well with the facing on this dress. 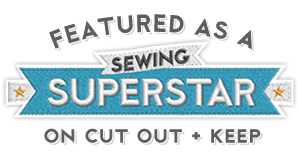 Instead, I used clear elastic, which I attached to the inside edge of the neckline on my overlocker, then turned the edge over, and stitched with a twin needle. I used this great youtube tutorial by Maria Denmark. I had a few goes on some scraps first, and found that stretching out the elastic first caused the fabric to gather a bit, so I didn't stretch the elastic before sewing it to my dress. My only issue with this dress is that the front is a bit low, and I had to sew a snap fastener to the front it to keep it closed. Although, having looked at other peoples' versions, it seems to be the way the dress is. I think I might need to make a full bust adjustment in order to raise the top of the wrap, but have no idea how to do this on a jersey pattern with no waist seam. If anybody knows how, or has done it themselves, please let me know. Thanks! Alternatively, I think I could add a bit to the shoulder seam towards the neck so I could then raise the wrap neckline. Anyway, I have been wearing this with a slip underneath, so it's grand, and it is also my second make from my Make Nine. I did and FBA on this dress. I cut it at what I deemed to be the waist based on where the opening for the ties are. I just cut the pattern from the "centre" (if there is one on a wrap dress LOL but hopefully you know what I mean - where the tie attaches) to side seam at that point and then did my standard FBA on the top half, reduced the width this adds at the waist and taped my pattern back together where I had cut it apart. Worked a treat. The coverage is better for sure. I have a bit of a problem with the shoulder seams being too far forward on mine. Just have never bothered to fix it on my pattern. I also detest the facings on this dress. They don't stay put EVER. I have under stitched, I have stitched an inch from the edge, I have made the facings so that they reach half way to the arm hole, nothing works, they always flip out and show. The fit is nice otherwise. I also after I made a way too short one for my first try and cut off the skirt to make it a top lengthened the skirt then cut the dress apart at the waist, then slashed and spread in 4 places front and back at the hem to get a flared skirt, then taped it back onto the bodice. I much prefer the flared skirt on this dress on me to the way the straight skirt is drafted on this dress. I just can't figure a good solution to the facing problem. I'm about to try an Appleton (I'm the smallest size) and flare that skirt using a sort of similar method. Really tempted to try the straight skirt on it to see if it is better on me because it is made for curves but just know that I like that more slightly flared good. Maybe on my second attempt of it??? Hoping the bands on it will be easier to manage than the facings on the SOI dress. Hope my description of how I did the FBA makes sense. Hi Lori! Thanks so much for your reply! What you did is what I was thinking of trying. I was considering it last Friday afternoon in work when I happened to be wearing this dress, and I was roughly going to try it on a post-it, then thought I'd really better do some work! I don't thick I'd do the facings on a wrap dress again, unless it's a dress with a collar, where they would be necessary. I just had so much trouble with them on the Kwik Sew wrap dress I made. Also, I love the idea of converting this into a top! I'd never thought of that. Thanks Sarah! The elastic was so easy, it's definately no more facings for me, unless there's a collar. Your alteration makes sense, especially if you find that an armhole is too low. 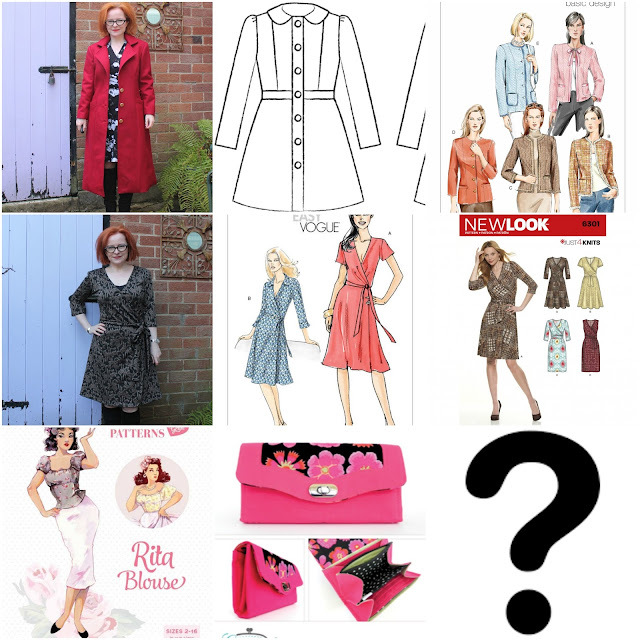 I have the Pauline Alice Aldaia dress pattern, which is for stretch fabrics, but haven't made it yet because the armhole is lower, and the bodice is longer than on some off my other patterns. One of these days I'll have a look at it! It's only February and you're smashing through your Make Nine! Well done. Someone looks like a big fan of wrap dresses over there ;) Looks fantastic (as usual)! 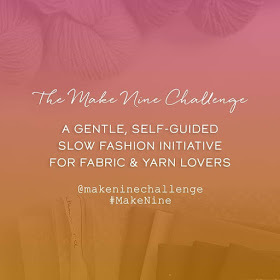 Love your Make Nine board, I might steal the idea for myself. The dress looks great, I quite like the idea of a wrap around top. I don't tend to wear dresses. Thanks Helen! I've seen some knitting Make Nine boards too, so it's not just for sewing. In fact, I think I've seen some boards with both!